We’re proud sponsors of this year’s Torbay Airshow taking place over the weekend of 1st – 2nd June 2019 at Paignton Green with viewpoints from right across the Bay. 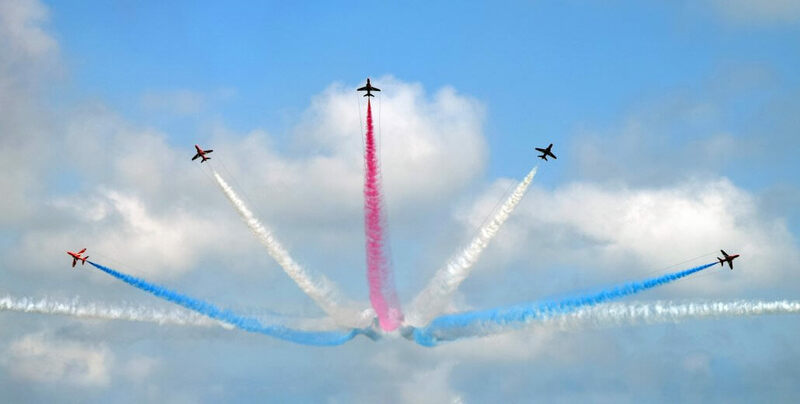 Each year the Torbay Airshow attracts over 165,000 spectators, with the main attraction being the iconic Red Arrows. This year’s show is reliant on the support of local businesses across the South West, so we have teamed up with a range of local organisations to show our support for this highlight event in Torbay. Our Field Sales Manager, Lauren Pybus said: “We’re always keen to support our local community, so when the opportunity arose for us to support this year’s event, we were more than happy to help. “The Torbay Airshow is a huge event in the local calendar and is enjoyed by so many people and families across the South West. We’re proud to be supporting this year’s show and we look forward to watching the fantastic displays”. Torbay provides a natural amphitheatre for viewing the air displays, with entertainment, trade stands, fair rides, bars and catering being provided on Paignton Green. 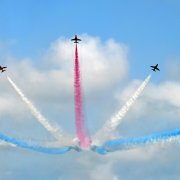 As well as the Red Arrows, there will also be action-packed displays from the Eurofighter Typhoon Jet, The Battle of Britain Memorial Flight, the Typhoon Display Team and the Tigers Freefall Parachute Display Team. If you’re looking for a new home in Paignton, come and visit our Fusion marketing suite and show home, located off Brixham Road, to explore the range of beautiful new homes available. We’re open daily from 10am – 5pm, or call our sales advisor on: 01803 523850 for more information.